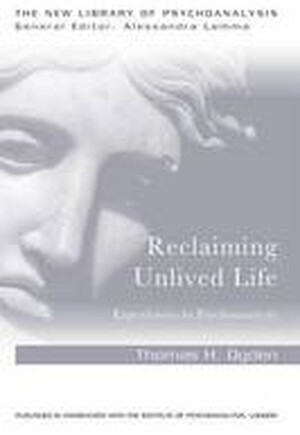 In Reclaiming Unlived Life, influential psychoanalyst Thomas Ogden uses rich clinical examples to illustrate how different types of thinking may promote or impede analytic work. With a unique style of "creative reading," the book builds upon the work of Winnicott and Bion, discussing the universality of unlived life and the ways unlived life may be reclaimed in the analytic experience. The book examines the role of intuition in analytic practice and the process of developing an analytic style that is uniquely one's own. Ogden deals with many forms of interplay of truth and psychic change, the transformative effect of conscious and unconscious efforts to confront the truth of experience and how psychoanalysts can understand their own psychic evolution, as well as that of their patients. Reclaiming Unlived Life sets out a new way that analysts can understand and use notions of truth in their clinical work and in their reading of the work of Kafka and Borges. Reclaiming Unlived Life: Experiences in Psychoanalysis will appeal to psychoanalysts and psychoanalytic psychotherapists, as well as postgraduate students and anybody interested in the literature of psychoanalysis. Truth And Psychic Change: In Place Of An Introduction; On Three Types Of Thinking: Magical Thinking, Dream Thinking And Transformative Thinking; Fear Of Breakdown And The Unlived Life; Intuiting The Truth Of What's Happening: On Bion's 'Notes On Memory And Desire'; On Becoming A Psychoanalyst; Dark Ironies Of The 'Gift' Of Consciousness: Kafka's 'A Hunger Artist'; A Life Of Letters Encompassing Everything And Nothing: Borges's 'Library Of Babel'; A Conversation With Thomas Ogden.